Mobile operators keep introducing different recharge plans with the objective of providing more facilities to their subscribers. It is also done keeping in mind the competition as telecom operations in India is one of the most competitive segment today. In fact, industry experts believe that this competitive spirit is beneficial to the end-user because in the cut-throat competition the recharge plans become more and more economical and affordable with added advantage of increased inclusions. 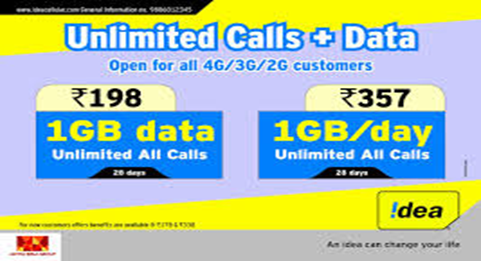 Unlimited plans – include voice and daily data plans; voice and fixed data plans; and sachet packs. Voice + Daily data plans are divided into three different categories – plans that are priced below Rs. 100; plans that are priced between Rs. 101 – Rs. 300 and ones that are above Rs. 301. The smallest sachet is priced at Rs. 9 package with unlimited calls and 100 MB data and 100 per day SMS included. This plan has a validity of 1 day. Similarly, there is the Rs. 19 plan with validity for 2 days and Rs. 59 small pack that is valid for a week. Both the plans consist of unlimited calls, 100 SMS per day and 150 MB/ 500 MB internet connectivity respectively. Internet plans are classified as 4G/3G mobile internet plans; 2G Mobile internet, 4G/3G Netsetter and 2G Netsetter. Voice plans include Talktime plans, Tariff Voucher, Bulk Minutes and Combo packs. The company also has a First Recharge/Plan voucher (FRC/Plan Voucher) that is especially meant for people who have just bought an Idea prepaid connection and intend to Idea recharge the same. The FRC 178, FRC 76 and FRC 229 are each valid for a period of 28 days. The FRC 555 and FRC 495 include unlimited calls, 100 per day SMS and 1.4 GB data per day. The first plan has a validity of 90 days and the second one is valid for 84 days. The FRC 595 includes unlimited calls and 10GB data and 100 per day local and national SMS with a validity of 180 days. Making Idea recharge more attractive are the online resellers. They are the ones that offer deals like cash back, discounts and use of promo codes wherein the subscriber ends up paying a much lesser recharge value than the actual market price. It is because the subscriber is able to use different deals and offers that either help them get back a certain amount of money spent or lets them pay a discounted value for recharging. In fact, since most of these resellers facilitate different types of online tasks and activities, conducting an online activity often results in getting discounts on another activity from the same site or App.